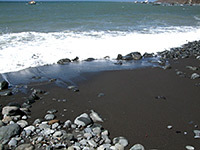 This is a description of the first five miles of the Lost Coast National Recreation Trail, from Mattole Beach campground at the end of the Lighthouse Road to a ruined building half way between Sea Lion Gulch and Cooksie Creek. Map of the Lost Coast. 28 views of the Lost Coast; photographs, slideshow. Walking south from the campground along Mattole Beach, the coast remains wide and sandy for a while, with a big flat area of sand beside the ocean and grassy dunes further inland, at the foot of hills that soon rise up 1,000 feet and more. The path passes a protected, fenced off area, once the site of an ancient Indian settlement; several shell middens can still be seen. A cluster of rocks out to sea approaches after a mile, linked to the mainland at low tide by terraces harboring many rock pools and deeper, narrow channels, all home to a great variety of underwater life including green anemones, pink and orange sea stars, crabs, mussels, urchins, shellfish and various kinds of seaweed. Occasional large shells may be found, from red abalones - up to 6 inches across and coated with a shiny, iridescent, pearl-like coating. The sand dunes fade away after 1.2 miles and the beach narrows towards Punta Gorda, a rocky peninsula beyond which the coast bends to the southeast. The rocks here also extend quite far out to sea at low tide, revealing many more pools. The first significant stream (Fourmile Creek) meets the ocean shortly beyond Punta Gorda, flowing through a steep-sided grassy valley, at the mouth of which are two wooden cabins, still furnished and used for occasional habitation. The abandoned Punta Gorda Lighthouse (in operation from 1911 to 1951) comes into view around the next corner - the walk can be either on flat rocks near the water or on a path over the grassy slopes inland. 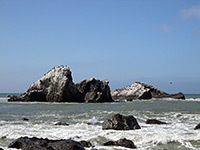 Some of the larger rocks just offshore harbor a large and vocal colonies of sea lions and elephant seals, and the animals can often be seen close up when resting on the nearby beach (see video). The lighthouse is the most visible remnant of a lonely settlement that once included about dozen buildings, all now removed apart from a small whitewashed shed, formerly used for oil storage. The main building has a few rooms downstairs, and steep, narrow steps up to the light enclosure, now empty. To the south, the beach narrows once more, the dark grey sand is soon replaced by boulders and the hillsides become more cliff-like, too steep for a trail, so walking has to be along the edge of the ocean - this is the first of several places along the Lost Coast where the route is cut off at high tide. The foot of the cliffs is lined with large fallen rocks, trapping much marine debris, though the coast is largely free of small scale litter. Another narrowish ravine (Sea Lion Gulch) emerges from the hills, after which a fairly well used path returns, rising quite high above the ocean which still comes right up to the base of the cliffs, with only a narrow, steeply-sloping strip of boulders and pebbles uncovered at low tide. The Cooksie Spur Trail branches off southeastwards, connecting first to the Cooksie Creek Trail that starts at the mouth of Fourmile Creek, and then to the Spanish Ridge trailhead, 2,500 feet up in the King Range. Near the junction are the ruins of two wooden dwellings, one collapsed, the other mostly intact, still with implements and food items on shelves in the kitchen, despite not being inhabited for decades. This abandoned house once had a fenced, cultivated garden and a pipe taking water from a nearby drainage, and must have been a beautiful if very lonely place to stay. For most of this section of the coast the land bends gradually to the southwest and there are no grand views; each curve just reveals another short section of coast, as far as the next promontory. 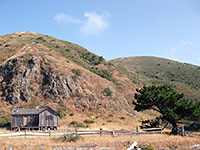 It is not until Spanish Creek (5 miles further south) that much more of the coast comes into view, but the old cabins are a good target for a day hike.